What a way to start my blog, writing about my journeys in some really exotic place! Yup, I took advantage of those AirAsia trips and it's a real bargain. I'm here in Kota Kinabalu, Malaysia right now which is the capital of Sabah. I took a ferry to Manukan Island yesterday which is part of the Tungku Abdul Rahman Marine Park, Malaysia's premiere marine sanctuary. It's a 15 minute speed boat ride from the ferry terminal. As soon as you left the terminal, you already saw corals below and right at the port of Manukan, you had schools of fish greeting you. At the beach, you swam with fish as well! Great beach! And a really great experience! I went back to Trekker's Lodge (which is a bed and breakfast place) where I was staying, my way of living the backpacker culture for the next few days. For dinner, I had nasi lemak (chicken with coconut milk, pandan rice and sambal sauce) and kiwi lou (just as I did the previous night) at a seaside cafe and enjoyed a really great view of the Sabah sunset. I'm off to Brunei today. 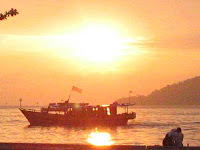 I will take a ferry to Labuan Island, then take another ferry to Muara in Brunei. Great to hear we have a new Pope! Viva il Papa! Anyway, have to rush! See you! do i need to check-in on a resort at manukan island or you can just do a day trip.. and is there a public bathrooms where we can take a shower afterwards before going back to the city.. thank you! 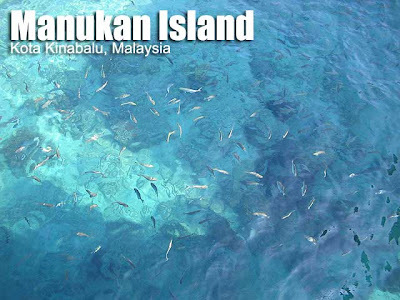 Yes, you can do day-trips to Manukan Island which is what I did. I'm planning a trip to KK next month. Would you recommend Trekker's Lodge? If not, pls give me alternatives. How would you rate Trekkers' Lodge? What other lodge would you recommend? Basic backpacker accommodation. It was the budget lodge suggested by people at the airport. 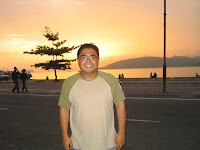 ivan is it not so strict from kota kinabalu to brunie...hindi ba strict ung immigration doon if i go to brunie...from kk to brunie using ferry?